A navy jacket and khaki chinos is probably the most fail-safe option for the modern man. 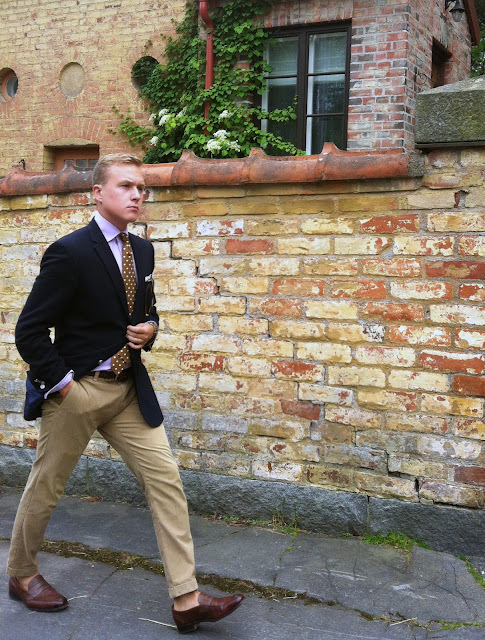 From a 12-year-old school boy to the executive on his Sunday stroll, it always creates a stylish impression that pleases the eye. However, there are some basics that have to be thought out before hitting the street. This is what I think they are. The first thing to think about, like always, is how the pieces fit you and your body type. A slim (but not overly slim) cut flatters a sporty to normal body, and is one of the most important things here. A loose and boxy jacket quickly kills all the style from the total. Secondly, I would suggest going for a softer shoulder as it makes the look more natural. 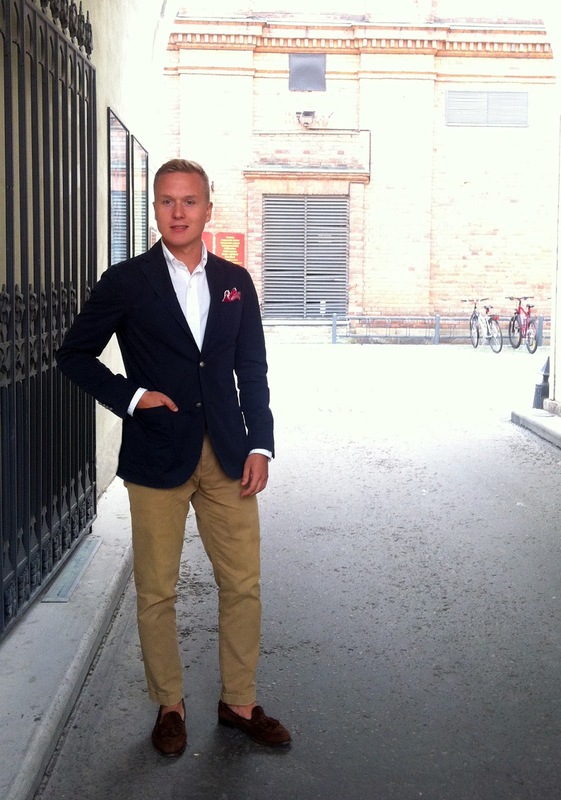 Padded shoulders often found in market cloths tend to create a very suit-like impression and making you look stiff and unnecessarily formal, which rarely works with more casual cotton chinos. Thirdly, avoid those 3-button jackets unless the it has been made to roll like a 2 1/2 or 3-roll-2. When you have the right jacket, you still need the pants to make it work. Pretty much the only and most important thing is how they fit you. A good rule is that they are made slim without making them too slim. You want to have about an inch or two extra circumference around the thigh and then slim it down quite strongly from about one inch above the knee to all the way down. If the leg opening is too wide, it covers your shoes in an ugly way, and also pretty much kills the whole look (I tend to go for about a 4.5-5.5 inch leg opening in chinos, and about 5-6 in suit trousers.). The length should be about what you see in the picture above, the cuff just meets the shoe, but not enough to create too much creasing along the leg. Black is not an option. However, just about everything brown goes. 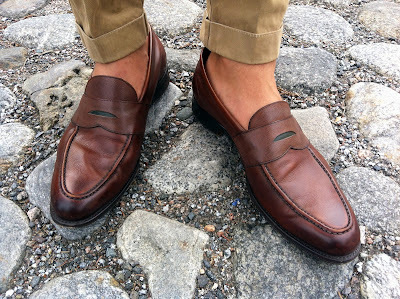 A pair of tan full brogues, chestnut toe caps, chocolate suede tassel loafers or perhaps espresso-colored penny loafers. Socks can be anything, but I would avoid too bright colors. A simple navy or brown pair is perhaps the best option, and to add some flair you can try navy socks with white polka dots, for example. Loafers can also be worn without socks as seen here, no problem, and don't let anyone tell you otherwise (unless it's your boss). Last, but not least, always keep your shoes polished and healthy - the final touch on any look. Then the accessories. First, you need a good shirt. Almost everything works, purple here shown is probably the furthest you can go from the normal choices of white and blue. 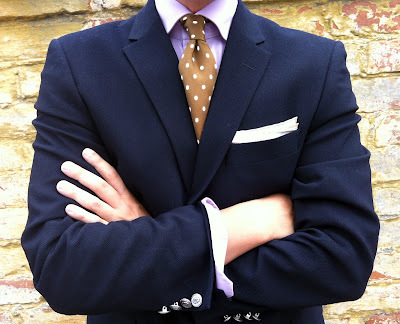 Almost all patterns work well too, and for example a blue stripe or a low-contrast gingham check can liven up the look succesfully providing the tie and pocket square are not too restless in their colors and patterns. 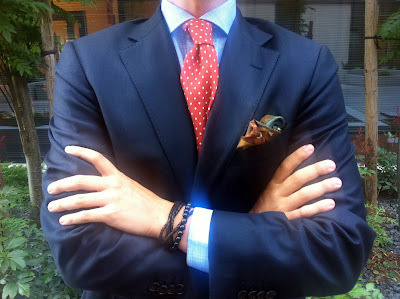 As this combination is never super formal, knit ties and other materials such as linen, cotton and wool also work well. 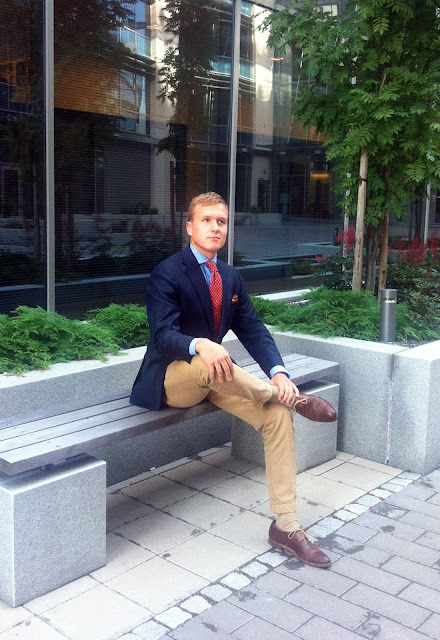 For a more casual feel you can also put on a button-down shirt and ditch the tie, as seen here in the third picture. Overall, if the basics are looked after, this classic can lift you in the crowd pretty much anywhere you go from workplace to a dinner. If everything fits you right, you have the right shoes and accessories there is no fear of being branded a pensioner in their musty club jacket. The only criticism I can give it, is that especially when worn every day it can be seen as a bit boring and in some cases perhaps slightly uniform-like. This does not however depreciate the style value of this combination by any means, as it is simply one of those that pleases any eye, anywhere.